“What is the price of career success for women? “The author takes us through the lives of three successful women, and in the inevitable juggling of home, family, career, sacrifices are made. The plot is well-crafted, the dialogue realistic and the characters well-drawn. The women whose stories are told in SHATTERING GLASS are struggling to balance family life with a successful career. What are some of the personal costs for women in achieving independence and success and in shattering the “glass ceiling”? In SHATTERING GLASS, Barbara is a highly successful novelist whose husband has trouble handling her success. Do you think a marriage can be adversely affected if the woman’s career surpasses her husband’s or she gets more public recognition or earns more money than he does? If so, how might a couple work together so the partner feels comfortable with her success? Do you think men are adjusting better now that this is becoming more common? Many women, through divorce or by choice, find themselves raising a child alone. Judy is a single mother who struggled to get back into the workplace and took on a highly recognizable and visibly successful career. What are the special problems a single mother might face in light of the child who waits for her at home? What are the best ways to handle them? Do you think changes in the economy, with more women joining the work force, have brought about new kinds of relationships between men and women? What about new kinds of relationships between fathers and their children? With so many women working today, do you think there have been any changes in how women — and men — see each of their responsibilities in the home? Because of the current economy many previously stay-at-home moms have entered the workforce, some for the first time and others having to re-train, like Judy. As a parent, what do you think the most difficult aspects of this would be, both for you and your child? Judy doesn’t tell her small son the real reason why his father has stopped seeing him. Barbara hides her husband’s physical abuse of her from their daughter. Dede suspects her sons may have been sexually molested but avoids discussing it with them. Should we always be honest with our children about what is happening in the family? Do you think the characters made the right decisions? Would you have handled any of these situations differently? All three mothers find it increasingly difficult to keep the lines of communications open between them and their children. What can parents do to be more effective in communicating with their children? In SHATTERING GLASS, the CEO of Judy’s company wants her to go to London on a business trip at a time when her son is going through a difficult period. When, if ever, should a woman put her job before her children? More and more women have become successful in the eyes of the world; however, as Nancy-Gay Rotstein’s characters reveal, when it comes to their children they tend to view “success” in a different light. What do you consider to be a “successful” woman? How does this compare with the perception held by our grandmother’s generation? Judy feels pressured by her son's request for things that he has become accustomed to and now, after the divorce, she can no longer afford. Should children be made aware of a family's financial difficulties? What advice would you give her or anyone facing similar financial situations, particularly with today's economic climate? Which character—Judy, Dede, or Barbara— do you most identify with? In what ways? All three women overcome obstacles in their lives to achieve their personal goals (their own “glass ceiling”). What can be learned from this book that you could apply to your own life and circumstances? On what level are these stories universally familiar? Can a woman truly succeed in balancing marriage, children and a career? How successful do you think you have been? 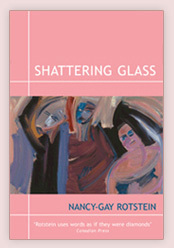 Now that you’ve read the novel, what is the significance of the title “Shattering Glass” to you?